Ever been so nervous and anxious that you can hardly stand? The sweaty palms, the unsteady legs, the trembling hands, the light headedness just to name a few of the symptoms. Fear of going to Hell for example can be a prime subject to get even the most sincere Christians feeling a bit woozy! Some people turn to God out of a fear of going to hell - In my view that is a distorted view of faith - Fear is NOT faith! In fact I heard once the fear is faith in reverse. Fear and faith are opposing forces. As Christians we should have a holy fear of God without being frightened of God. If we are frightened in our walk with Him, it makes me wonder what are we actually afraid of? The answer to that is generally Hell - Some can be very frightened of Hell and it consequences. Walking in fear with God instead of in Faith with Him is actually believing in something other than God and that something is more than likely a fear of going to hell. People walking in fear of going to hell and trying their utmost to live Godly and/or holy lives are actually trying to earn their own salvation and not really trusting in God at all. Fear can lead us into a dark place and as we know God is not the author of darkness but the King of light. Timothy 1:7 says "For God has not given us a spirit of fear, but of power and of love and of a sound mind". 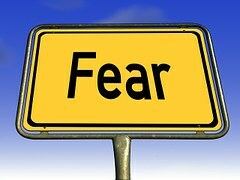 Fear doesn't sound like God to me at all - Fear reduces our faith in God making us focus on the situation and keeping our eyes off Jesus altogether. Satan is the author of fear - He loves to hit us where we are most vulnerable and if our fear of hell is where our weakness lies then that is exactly where he will aim his artillery. The devil will lie to us and his lies are focussed on telling us that we need to act on our own because we can't trust God to be there - or is God really there? So come to Christ because of your faith not because of your nervousness about going to hell when you die. Yes! there is a hell that's for sure, but we need not worry about it ever, if you have faith and love for Jesus. Faith as a little child has faith in their Mum and/or Dad. A child-like faith, no matter how small or weak. Actually weak faith is the very time that God can use us - in our weakness then we are strong because in our weakness we rely on Him and Him alone. Having fear instead of faith is like looking and walking into a huge tunnel that only goes deeper and deeper into the darkness - faith on the other hand tells us we are going in the wrong direction - turn around and see the light - you have been looking and walking in the wrong direction. You won't see the light while you are focussed and concerned and worried about stumbling along in the dark. Living in fear of going to hell makes us rely solely on our ability to be 'holy' or to gain God's approval by the amount of times we can withstand temptation, Or mount up 'brownie points' by helping others and knocking ourselves out working for the church. Faith tells us the exact opposite - there is absolutely nothing we can do to make God love us more than He does already - there are no amount of good works that will gain us entry to heaven - no amount of 'holiness' on our part will open the gate to God's glory. All that is required of us is simple trust in the God who saved us through the sacrifice of Jesus and then live according to Ephesians 5: 8-16 - Grab a new version or a plain English version e.g. The Message - tells us plainly and simply. So if you came to Christ mainly based on your fear of ending in Hell then you are more than likely trying to earn a way in with Christ - there is absolutely no way you will be able to 'earn' your way into Heaven. Let's put that notion to bed once and for all - Put aside your fear of hell and it's consequences, come to God and repent asking Him to 'help your unbelief/doubts. "If you can do anything, do it. have a heart and help us!" Jesus said "If? There are no "Ifs' among believers. Anything can happen." No sooner were the words out of his mouth that the father cried. "then I believe. help me with my doubts!" Sort of says it all doesn't it! So what can we take away today - Fear is not faith! and faith is not fear! Jesus died an agonizing death why? to pay for all of your sins - the past, the present and future. Trust in Him as He trusted in His Father to always do what it right and good. No amount of things and/or work will get us into heaven. It is only through faith that we will gain access to God. I trust you will be blessed as you pray the prayer that young Dad prayed all those years ago. "Father, I do believe, please help my unbelief and doubts"